Over at 'Less is More' is a Sketch Week using a DL shape. I have used a white base card and layered some pink card then more white card. I have printed the sentiment direct from the PC using 'Francine' font. The flower I was given a long time ago in a set with ribbon that you have to thread through the holes. 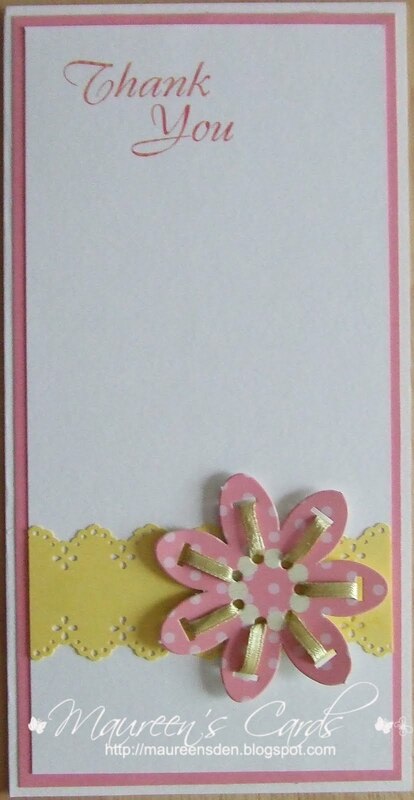 I added a yellow border to match the yellow ribbon on the flower and punched it with my Martha Stewart punch. Chrissie & Mandi set some great challenges every Saturday on 'The Simply Less is More' blog so get yourself over there and join in the fun. A great start to the weekend. What pretty colours Maureen and that is a really unusual ribbon treatment... super! I like that font... I may just have to acquire that one! Thanks for another super card! Lovely Card Maureen, I have never seen ribbon threaded through flower petals before. I like this one, the flower is different with the ribbon. Very pretty card. Love your soft colours. beautiful! You've got to love a martha stewart punch!! Very pretty card - I do like the way you've used the ribbon on the flower! Maureen, I love the pink and yellow combination! Fabulous card! Lovely colours, I have not mastered the sentiment printing yet, it goes all over the place. A fabulous card Maureen, I love the fresh colours, and your flower is just perfect. That looks great - must get some punches, i feel deprived now! !